Clean and cut cauliflower into small pieces and rinse in a colander or large strainer. Cook in boiling water for about 6 minutes, or until well done. Drain well; do not let cool and pat cooked cauliflower very dry between several layers of paper towels (I use two plates and place the boiled cauliflower on paper towels on one plate, cover them with paper towels, then place an identical plate over that, then flip the whole assembly over, remove the top layer of paper towels and replace them with dry ones. Continue to switch and flip until towels run dry). 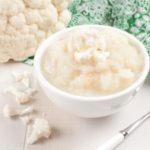 In a bowl with an immersion blender, or in a food processor, puree the hot cauliflower with the cream cheese, Parmesan, garlic, salt, black pepper, white pepper and nutmeg until almost smooth. Now is the time to stir in the sauerkraut if you are adventurous, and heat the whole mixture in a microwave so the kraut warms up. This can be prepared ahead of time and easily reheated in a microwave; this can also help dry it out bit if it turns out too wet.